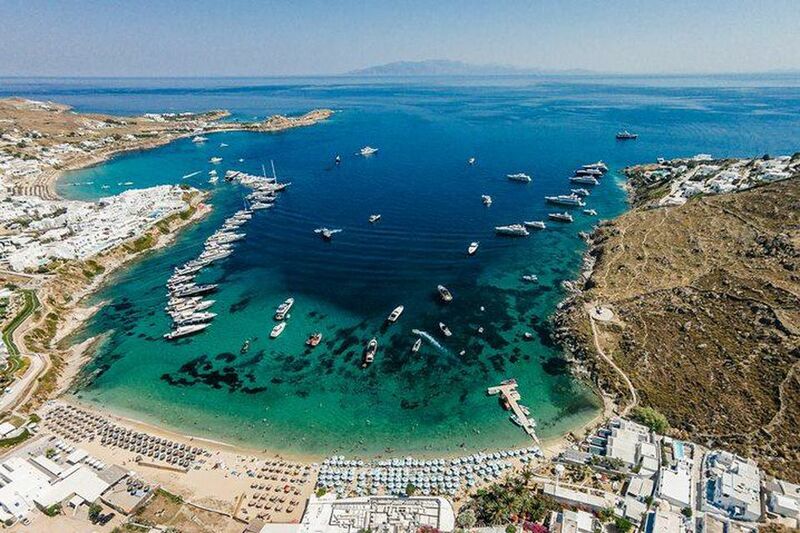 Mykonos has around 30 accessible beaches. Most of them are sandy and they all have turquoise waters. It would be great if you could visit all of them but, as this should take a lot of time, we have prepared for you a list with the most fabulous, well-known beaches on the island. 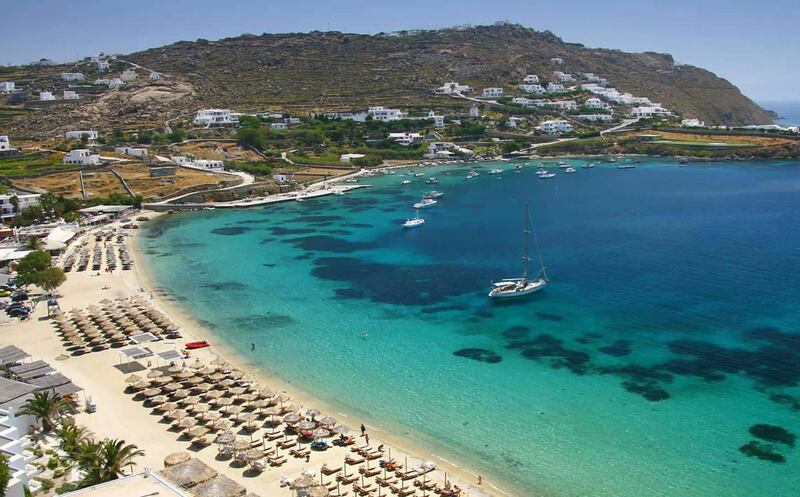 Around these beaches you will find a lot of Luxury Mykonos Villas for rent. It would be a good idea to rent a Mykonos Villa near a famous beach, as you will have easy access to a number of nearby beaches. This is the beach where you can find yourself sitting next to a famous top model or a film star. Psarou is the beach that most celebrities and VIP prefer. 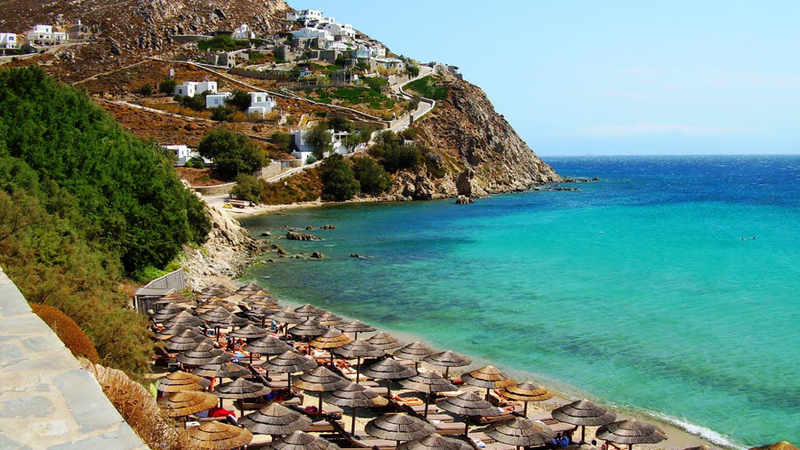 It is located at the southern seashore of Mykonos and is one of the four known as “the party beaches” of the island. Here you will find the world famous Nammos restaurant. During the day you can rent a lavish sun lounger, have a meal at the restaurant or try some water sports. At nights you can have fun at Nammos crazy parties, listen to the latest beats and dance barefoot on the beach. Situated on the northern part of the island, Panormos is a quiet, partly organized beach surrounded by hills protecting guests from the winds. The beach has 2 restaurants. Principote is not just a fresh fish restaurant but actually an all-day resort where you can spend many hours on the beach and have anything you could need near you. Kalosta is a traditional tavern on the hills above the beach with local menu. Paraga beach attracts mostly young tourists who wish to relax next to the sea and have fun. It is also one of the party beaches of Mykonos but it is not as noisy as other beaches of the island. A part of the beach is rocky offering great opportunities for snorkeling or diving. Paranga has a lot of venues to have a drink or a meal. Among them you will find the well-known all day bar-restaurant Scorpios and Santanna which combines luxury, relaxation and quality services. Ftelia is a beautiful beach north orientated, receiving the Meltemi (the Cycladic wind coming from north) and for that, it is particularly famous among the windsurfers. A very peaceful and uncrowded beach, which is somewhat surprising because it is quite accessible from Mykonos town. Although, Alemagou and Ftelia beach restaurants which are located there, are two of the most famous venues of the island which combine perfectly the bohemian atmosphere with high-quality services. It is maybe the most famous party beach on the island with wild parties attracting hundreds of visitors every night. 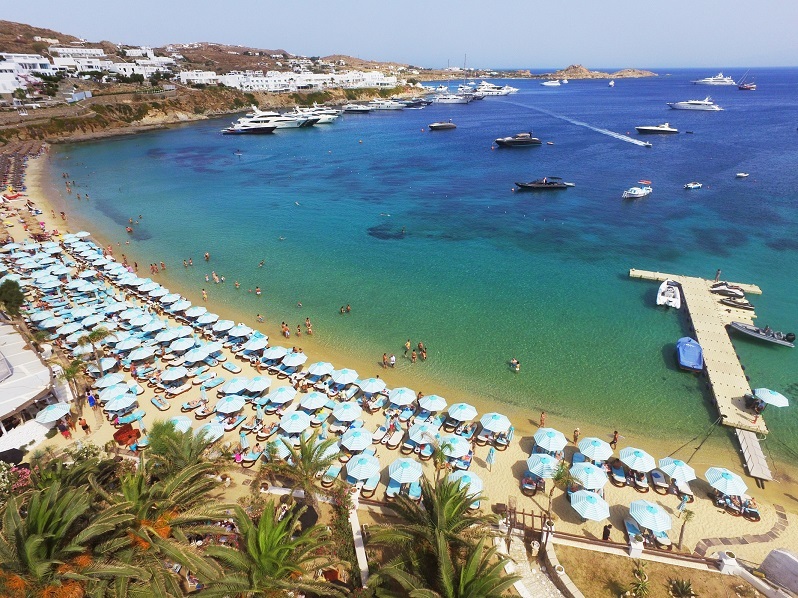 At day time it looks like a usual Mykonos beach with comfortable sun beds and umbrellas, with soft sand and transparent waters. Early in the evening the 2 big clubs on the beach, Super Paradise and Jackie O’, turn up the volume and the dance music fills the air. Elia is one of the longest sandy beaches in Mykonos. It is organized and easily accessible by car, taxi or public bus. It is a lounge, family-friendly beach with a lot of amenities and 2 restaurants: Elia and Capelayo with different cuisines. One end of Elia beach is a nudists’ area. If you are into water sports, you will find a big variety here. 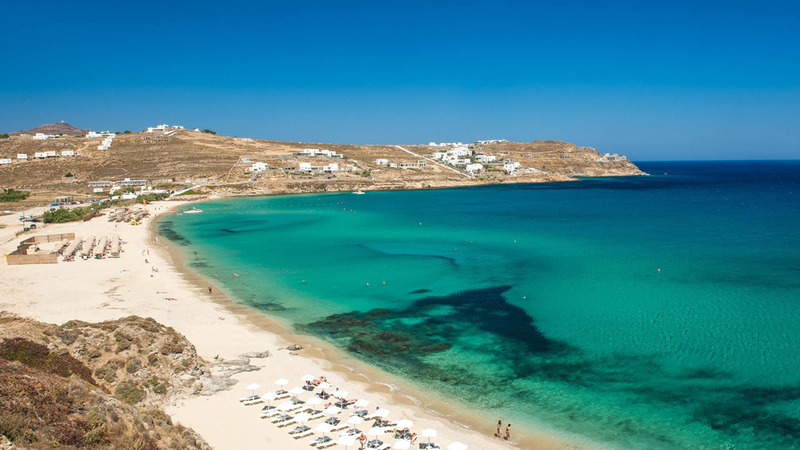 Situated just 3.5 km from Mykonos Town, Ornos beach is a great choice for families or groups. It accepts many visitors but usually doesn’t get crowded or noisy. There are plenty of options for food or drinks and sun beds and umbrellas are available for rent like Kuzina, Pasaji and Apaggio restaurants. Saint John or Agios Ioannis, as the locals call it, is located at the south west coast of the island. The famous “Shirley Valentine” movie was filmed here, capturing the idyllic landscapes of the beach. The sand is mixed with pebbles so it would be a good idea to bring your aqua shoes with you. There are 3 restaurants on the beach offering a variety of menus: Hippie Fish, Beefbar and Pili. This beach offers a balanced option between party and lounge beaches and is one of the most famous beaches on the island for its turquoise crystal clear waters. 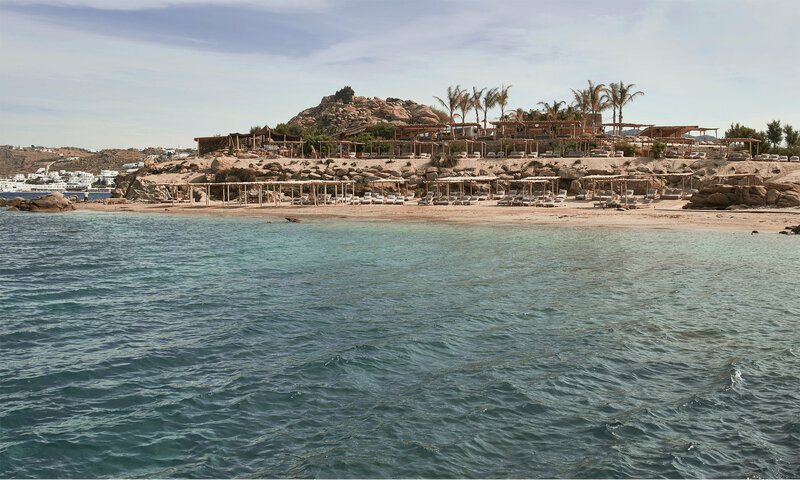 On the left side of the beach you can find the famous Solymar restaurant while on the right Lohan beach club restaurant. near a famous beach, as you will have easy access to a number of nearby beaches.